When did you last let yourself play? Not sport or games or politics. I mean play like children: inventing, creating, making or surprising… without imposing all the rules that adults seem to need to set, turning life into routine and mere existence. As a full time mother to two girls, 5 and 3, my friend Sophie rarely has time to herself: thinking, being, resting or just empty time. It’s how she wants it but that doesn’t mean it’s easy. As a writer my days are the exact opposite: crammed with all the space and solitude I want, often carved out by pushing people away. For me, it’s the real people bits I sometimes crave. So when Sophie and Matt asked me to spend a couple of days with them and the girls at their shared holiday shack in Swanwick, I didn’t hesitate. The only thing planned: a walk in Freycinet National Park without the girls. Matt was able to put his remote-work aside for a morning, just especially. We decided against Mt Amos because it seemed like an obvious track. Sophie had once worked in the park as a discovery ranger and suggested the lesser-known Mt Parsons climb you take from Sleepy Bay. Several couples were lapping up the day in the bay, but there seemed to be no one venturing further up the rocks, climbing steadily over granite boulders marked by rock cairns and white flowering ti tree. We made our way making unplanned stops, to stand or sit and chat, as you should, on a hike with no agenda. Had conversations that spring from sharing a walk with a friend who likes to notice things more than you. Our conversation somehow softened the drama along the way: the surprising caves and crevices, broad caverns and high gullies that we passed through seem even more astonishing now I recall them. But the ginger footsteps we planted firmly to look down over the cliff’s edge were very real. It reminded me of the Amalfi Coast, except if we’d been there we would have been sipping cocktails next to a swimming pool it’s that populated. We had climbed high enough to see all of Coles Bay township when Sophie pointed out a rare mountain dragon (the only species of the dragon family living in Tasmania) darting under a rock. I loved how she could master distance and detail too. It didn’t matter that we didn’t make it to the final 360-degree viewing peak. We needed to get back before the girls’ afternoon nap. From our vantage point we looked out over a vast landscape and decided this was our wilderness moment for today, only two hours from the dining table: to be on The Hazards on a clear day, sharing a sense of stillness unchanged since these granite peaks were formed. We savoured the same breeze on our skin that carried sea eagles above. While Sophie and I had collected time together, when we returned to Swanwick her two girls had been playing and made a Welcome Home for their mother and her friend. 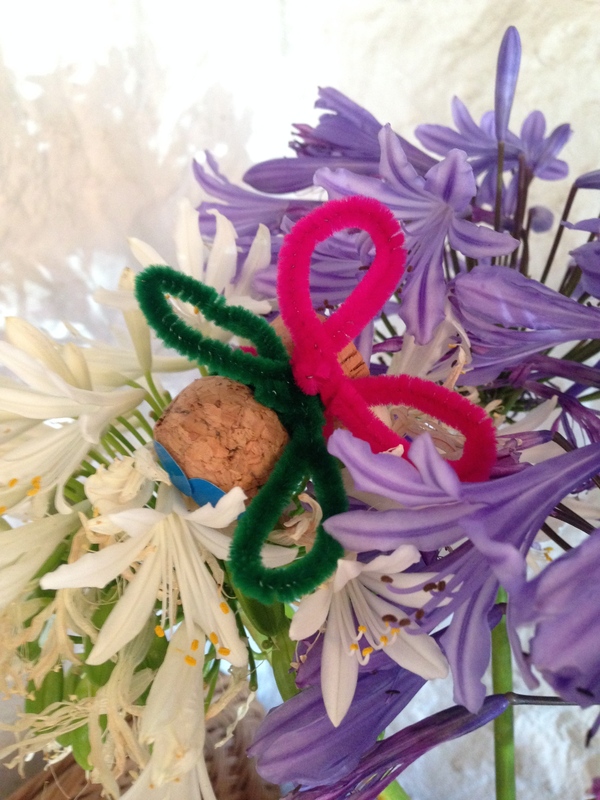 They’d turned last night’s champagne corks into bees with neon-coloured pipe cleaners for wings. Skipping around the long dining table with their cork-bees held above their heads, each imagined them into flight with a gently hummed “bzzz, bzzz, bzzz”. It was the sweetest thing. Imagine a world where the urge to protect child’s play is more powerful than the urge to go to war. It is a TV screen-free home in line with the teachings of the Tarremah Steiner School near Kingston that both girls attend. For the first seven years of life, children brought up the Waldorf/Steiner way are allowed free creative expression (“when you look at a child, there’s your curriculum” explains one teacher). The focus is on creative play, stories and interaction with nature within a nurturing beautiful environment. It is the height of irony that while many schools follow the lore of the Ipad, allocating screens to every child, the children of Silicon Valley executives are being sent to schools where there are no computers or electronic devices. A 2011 New York Times story reported that engineers and executives from companies like Apple, Google and Yahoo were sending their children to a Waldorf elementary school in California where children are discouraged from watching TV or logging on at home. Even the late Steve Jobs, in an interview with technology reporter Nick Bilton on the launch of the Ipad2, admitted his three children had not been used as guinea pigs for his Ipad and were even limited in how much technology they used at home. Instead, they were allowed to play. When the referee says ‘let’s play’, let’s remember how we played like children. Try to recall what you loved as a child: running free, singing without worrying, dancing without thinking, painting without a care, asking questions without fear. We may think we know it all but when we play we are forever learning. This long weekend, we are invited to wake up and think about the women in our lives, focus on women’s achievements, and reflect on what still needs to change. On a personal level, this International Women’s Day I will have baked something purple-y to eat, called my girl buddies; painted the town purple (#paintitpurple is one of the official hashtags). When it comes to the representation of women in politics, Australia has an impressive lineup of firsts, with female premiers, governors, a governor general, prime minister, attorney general, and now, in Queensland, a majority of women ministers with eight women (including premier Annastacia Palaszczuk and her deputy) and six men. The gender balance was so apparent and unusual it made the portrait on the steps of Government House mesmerizing. Yet, more than a century of International Women’s Days and activism have not changed the fact that women are still under-represented in parliament. Compared with other national parliaments, Australia’s ranking for women in national government continues to decline, hovering around the critical mass of 30%, which is the figure regarded by the UN as the minimum level necessary for women to influence decision-making in parliament. In 2013, Australia came a lowly 44th in the top 50 ranked countries for women in national parliaments. And, despite Tony Abbott’s claim that he was “disappointed” with the number of women in his own Cabinet, he picked just one among 18 men. As Minister for Women, this was somewhat of an own goal; as PM, it showed his leadership in this area to be hollow. There would be no need for an International Women’s Day if our system of government, increasingly disparaged today, was given a makeover from one that is not just harder for most women – and so hard for some it is plain they choose not to participate – to a system made easy for everyone. I am ambivalent towards organized days. Often they are not what they seem. How can we properly celebrate Australia Day on the same day that it was claimed for Britain? Or, march on Anzac Day, with its focus on sending young people to war rather than building an ideal of peace? So, on International Women’s Day, while being grateful for some change the women’s movement has seen in recent times, we must also reflect how women are not represented and how they are paid less. I’ve done my fair share of banging on about women’s rights, as deputy editor of British Cosmopolitan and editor of Australian New Woman in the 90s. I now understand how sometimes it doesn’t help reacting to life events from a gendered perspective. Attacking men can become a self-fulfilling prophecy, causing more division while holding back women from finding their own way. In gender wars, often we are defined by our response to men, and what they will allow, or not allow, us to do, rather than by finding our own true voice. This International Women’s Day, Malcolm Turnbull is on the radar as Prime Minister. I once sailed in a boat with him on Sydney Harbor and recall him being far from comfortable with me at the helm. Although I could sail he kept trying to take the wheel. Since then, his light has risen and fallen and is rising again. As an intelligent man hopefully he has learned his lessons in leadership. Showing acute self-awareness, Turnbull went on to say that he knew himself to be a far bigger person with his wife rather than without her. His challenge, if he becomes PM, is to hold on to this belief. He may then not only be a great prime minister but a great man too. Why should the values of leadership be any more complicated than this? When this happens, when this Aussie spirit kicks in, we may well have real leaders and real equality – and that will be the day to celebrate. Ever since I bought a $2 packet of seeds from an elderly couple at the Longford Flower Show a decade ago I’ve been fascinated by seeds. They were old-fashioned sweat pea seeds, numbering only about a dozen, and came wrapped, like mixed lollies, in a plain brown paper bag. They proved to be sweets for the garden. I’ve been collecting their descendent seeds and passing them on for years now, always remembering how that Longford couple had told me of the beauty of their fragrance. Over the years I’ve passed them on to people who come to visit and sold them as Nuns’ House seeds in brown paper bags at Lilydale market. 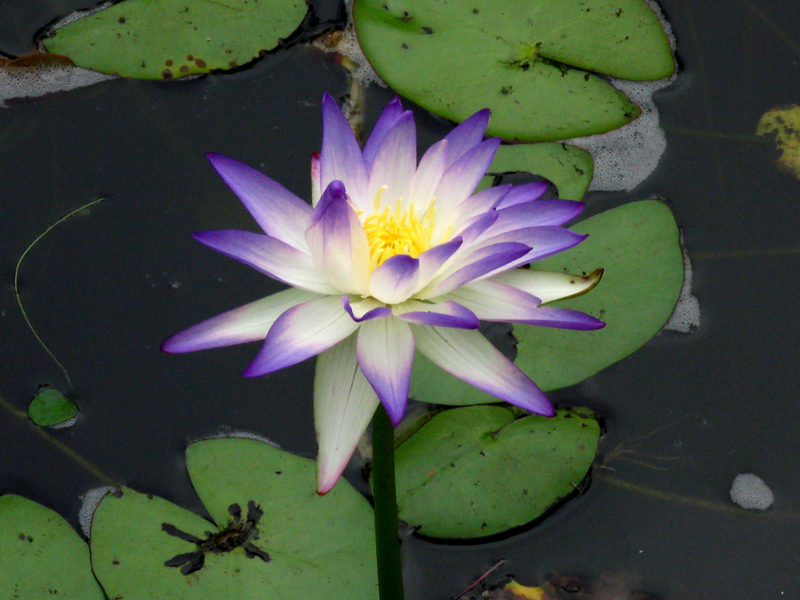 People have reminded me, years on, how the dual-purple flowers had bloomed and how dreamy they smelt. They have brought me simple joys and I’m forever grateful for having found them. It’s that time of year again, when I’m sorting out the seeds. I could give some to you now if you were to drop in. That’s the beauty of seeds. I don’t mean the kind you buy in colourful glossy packets from the garden centre – athough they are useful too. The kind of seeds I mean are local, saved, that you have been witness to and seen through a life cycle. They seem to connect you to a way of living where you are, that I know to be precious. I think, as precious as families. Seeds have roots too. More often than not, people who save seeds from their gardens will tell you how best to grow them. My sweet pea seeds, for example, get saved in a bag in a cool place, then, just tossed into the garden on St Patrick’s Day, against a wall, fence or gate, where they might ramble and get a sprinkle of water every now and then, when the days are warmer. And, sure enough, by the first day of spring, my sweet peas will be up, all tangling tendrils and bursting into flower and heady fragrance. I love the way seeds are packaged up in nature, and how every flower has different packaging. The sweet pea flower dries and hardens to a crescent-like pod, packed just so with seeds. Then, when ready to burst, they spring out so fast they’ll have you chasing them all over the kitchen floor. I also love the cup-like seed pods of Love in a Mist that, if shaken, sound like mini maracas. Double joy: you can also use the seeds (nigella) in cooking. The pods of a particular white wisteria are a new fascination, like flat broad bean pods, or dangly earrings. Sunflowers left to dry and go to seed teach melancholy in the garden and when you’ve had enough just throw them to the chooks or save them for next year’s planting. 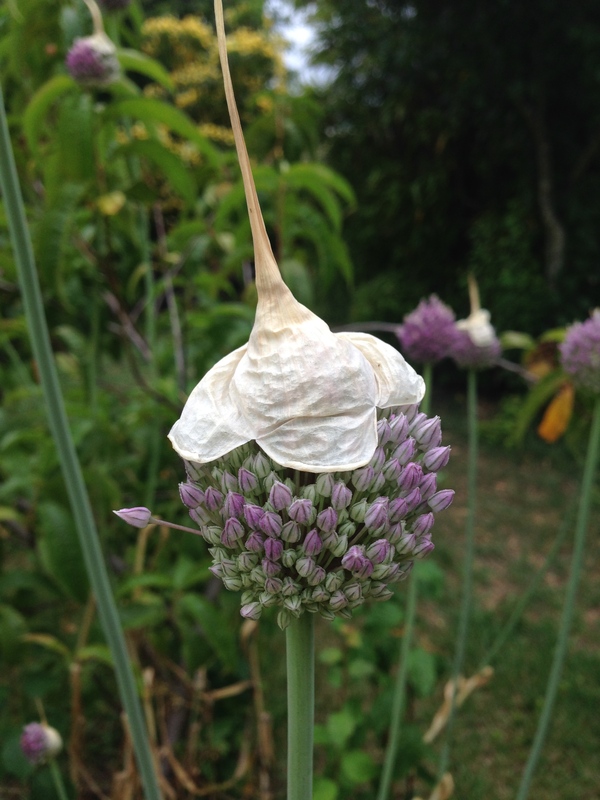 Angelica blooms, too, make pretty dried arrangements, as do artichokes left on the plant you couldn’t be bothered to cut earlier in the season. And, when the border of wild Watsonia leaves finally withers and dries, I cut some right back to the ground, while others I leave only because the frost looks so pretty clinging to vertical dried stems. Poppy fields with dead heads are such things in the Tasmanian landscape: so much so you’ll often see people stopping to photograph them from the roadside. Seeds come in packets but it’s only when you grow your own seeds you realize their true nature. So I was riveted when English physicist Professor Brian Cox introduced viewers to the Doomsday seed vault on Human Universe, his fascinating program currently showing on ABC TV. The Svalbard Global Seed Vault is seed heaven on an incredible scale. At last count, the total number of seeds buried underground in frozen caves, 1300 kms from the North Pole, was over 20 million. There are 32 varieties of potatoes from Ireland’s national gene banks and 20,000 new samples from the U.S. Agricultural Research Service. Other seed samples came from Canada and Switzerland, as well as international seed researchers from Colombia, Mexico and Syria. The Svalbard Global Seed Vault’s mission is to provide a safety net against an inevitable loss of diversity in traditional gene banks. US Conservationist and vault visionary Cary Fowler told Professor Brian Cox while some people thought the seed bank was depressing because its existence accepts that the world might be doomed, he said he thought it spoke of hope. Hope that, given the destructiveness of humanity, we might at least have been clever enough to save enough seeds to keep future generations alive. Which is the ultimate cleverness of seeds: that in their seeming deadness they hold the potential for life. Just make a point of popping a handful in a paper bag over the next few weeks: see for yourself.